TRACLabs developed a seven-degree-of-freedom reconfigurable modular manipulator (RMM) for NASA to use on planetary analog rovers. Every interface between joints, between a joint and a base mount, or between an end-effector and a joint is identical. This coupling is called the Universal Mating Adapter (UMA), and provides a strong mechanical attachment, power transfer, and data connections across the interface. All power and data lines run internally through each joint and UMA, eliminating external cables. An independent internal data line enables the base to communicate with an arbitrary third-party end-effector. Each joint in the RMM contains its own control and power electronics, so that a base UMA socket requires only a USB connection and a power source. Each joint accepts position or velocity commands, and is capable of creating trapezoidal velocity profiles to fit the command. Each joint contains both absolute and relative position encoders, a failsafe magnetic brake, and non-volatile memory that stores relevant electrical, mechanical, and kinematic parameters. The RMM has been incorporated into a 2-arm in-house mobile manipulator project called “TRACBot”. TRACBot has been used in several NASA and DoD projects investigating mobile manipulation. 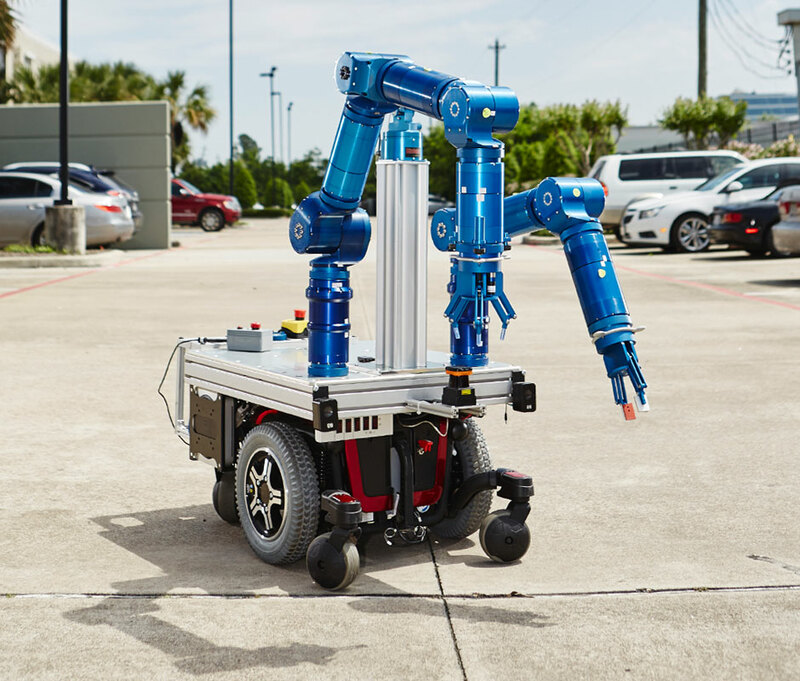 As part of these projects, TRACLabs developed ROS nodes for controlling the RMM and the mobile base, and created a simulation of the robot and its environment in Gazebo.